This document was produced by a Working Group of the California Ocean Protection Council Science Advisory Team (OPC-SAT), supported and convened by the California Ocean Science Trust. The State of California Sea-Level Rise Guidance Document, initially adopted in 2010 and updated in 2013, provides guidance to state agencies for incorporating sea-level rise projections into planning, design, permitting, construction, investment and other decisions. Now, the California Ocean Protection Council and the California Natural Resources Agency, in collaboration with the Governor’s Office of Planning and Research, the California Energy Commission, and the California Ocean Science Trust, are updating this statewide guidance to reflect recent advances in ice loss science and projections of sea-level rise. 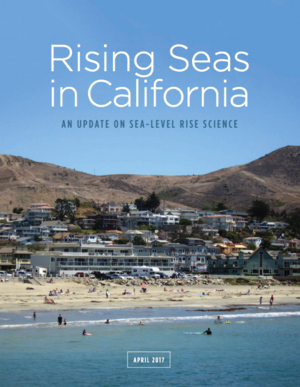 This document, requested by the California Ocean Protection Council and guided by a set of questions from the state Sea Level Rise Policy Advisory Committee, provides a synthesis of the state of the science on sea-level rise. It provides the scientific foundation for the pending update to the guidance document.